Many people have bumps and dips along their nose when viewed from the side but don’t want to undergo surgery or can’t afford to. With carefully placed dermal filler it is simple to correct these areas in one procedure. Whether it is a previous injury, genetic or racial norm, fillers are a quick and easy solution that will also allow you to see what your nose would like if one day you opted for surgery. 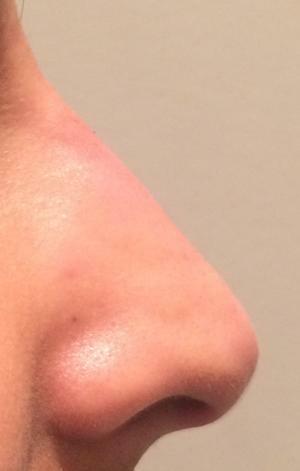 The photos below are of one of Dr Renee's patients before and after she reshaped her nose. The treating doctor will take several angle ohotos and then discuss the issues that you are wishing to correct before starting the procedure to fully understand what you wish to try and achieve as everybody has a different defect and end result aim. It is important to individualise the treatment. 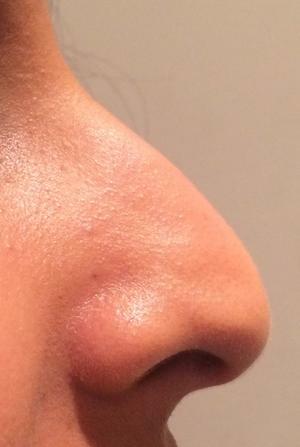 What is clear from vast experience using hyularonic acid fillers for nose striaghtening is that the effect does not last longer than around 6 months. What we therefore recommend is that the first time you have the treatment you do so with an hyularonic acid filler to ensure you like the end result. After this you could consider an Ellanse prodcut lasting for 2 years. Your treating doctor will discuss this with you at your consultation.